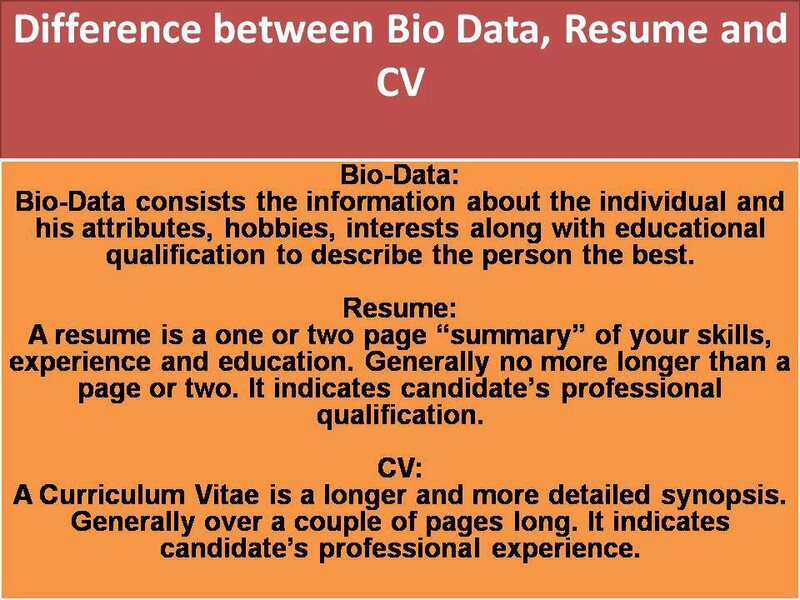 KnowCrazy.com: What is the difference between Biodata, Resume and CV? 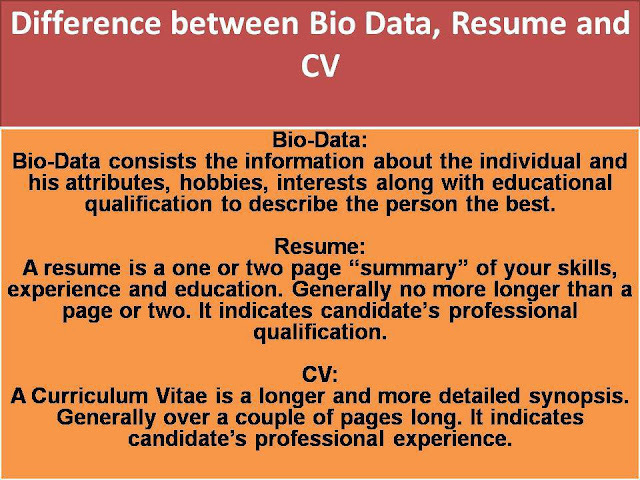 What is the difference between Biodata, Resume and CV? Biodata is a commonly used psychology term for biographical data. Biodata surveys are in the form of multiple choice questions. In India, Pakistan, and Bangladesh, a biodata is essentially a resume plus physical attributes, such has height, weight, hair/skin/eye color, and a photo. An application form is a form created by the employer to collect information from job applicants. It may include much of the same information as a resume, but it is organized for the convenience of the employer. A resume includes a work and salary history, educational history and job objective. A résumé is a summary of a person’s educational background and work history for a potential employer. The word, which comes from the French ‘résumé’ and means ‘summary’, thus points to the conciseness of this type of professional document – a résumé generally holds on a single page. Résumés are used in North America and in countries under American cultural influence. A curriculum vitae is a list of one's professional and educational history and tends to focus on one area of expertise. It's commonly used by authors, researchers, speakers, professors and other experts in a particular field. A curriculum vitae (usually shortened to CV) is the norm in Europe as well as in countries with which it traditionally has cultural ties. In keeping with the Latin meaning (roughly equivalent to ‘course of life’), the phrase usually refers to the short account of a person’s career and qualifications that is prepared when applying for a position. It thus provides the occasion to delve more deeply into an applicant’s educational, professional and personal details. And this explains why in the USA doctors, scientists and academics also use CVs.